The Thames Coast Road has been a challenge this year, with ongoing slips and road blockages. Yes, nothing changes. The road has been a challenge from the time it was first opened. Developed from the tracks that were used by the first settlers. In the early days of the goldfield, many a Thamesite made the trip to Tararu as part of their precious Sunday 'day of rest' activities. In 1898 contractors such as Mr Hawkes, took loads of Thamesites to the area in his brake - weather permitting! 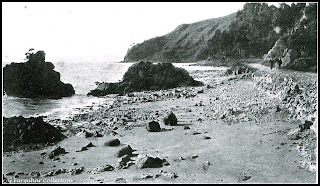 In the early 1900s, a bike ride to the Fishing Rocks (aka Rocky Point) just north of Tararu township was a regular excursion. 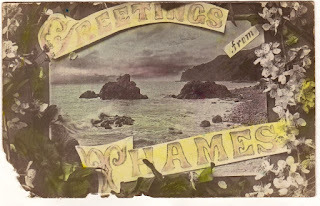 Consequently, many postcards were published of this familiar place. Simply captioned in most cases as the 'Fishing Rocks' - no more explanation needed. ABOVE: The classic view of cyclists at Tararu. The Fishing Rocks got their name it appears because they were a great place to fish. Sadly in 1899, John Randle was drowned while fishing on the landmark. He was found in the water, while on the rocks above were two fish and fishing gear. It was therefore surmised that Randle must have slipped while fishing. In 1884, the Thames Borough Council acknowledged the work and assistance required to maintain the roads in the area. Several men had been working north of Tararu and it was seen as imperative that they be kept on. The job was so big it was felt that Government assistance was required. 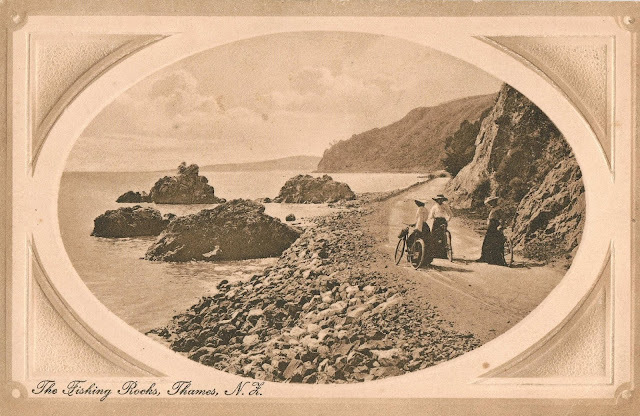 In 1905 it was advocated by many that the Fishing Rocks area would make the ideal deep water harbour accommodation and that a breakwater should be built off the rocks. The water free from silt and the sea depth considerable as one moved out to sea. This plea had been heard previously in the 1880s with no action taken. 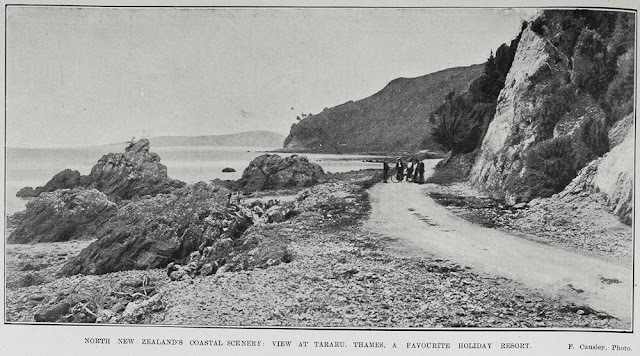 As transport changed from horse to cars, and more lived down the coast, it was necessary to make improvements to the road. In 1922 the Thames County Council considered a toll gate on the coast road as a way of gathering revenue for road maintenance. In the Thames Star 10 January 1935, a survey was reported on data collected on New Years Day. The objective was to highlight the need for tar-sealing of the Thames Coast Road north of Thames. It was found that in the 12 hours between 7am to 7pm, the traffic numbers were: 867 cars; 91 trucks; 49 buses; and 70 motorbikes. Gradually the road surface was improved and sections were sealed. The landmark 'Fishing Rocks' remain. No longer a destination due to inpart to the lack of parking in the area, just a landmark to pass as travellers venture north along the coast. Today the point is more commonly known just as Rocky Point.